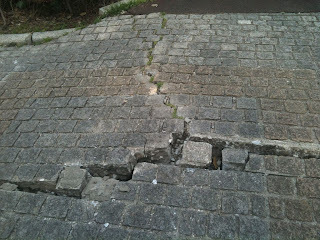 Sidewalk split on the way to the neighborhood park. Today we went back to the park, it is almost therapeutic for us. We met with other families to have a small picnic and talk about things that happened and the potential things that could happen. Most of the time we just chased after our kids though. In fact while we were there a magnitude 6.2 aftershock struck just off the coast of Ibaraki again. It was good to know we were in the safest place possible at the time. 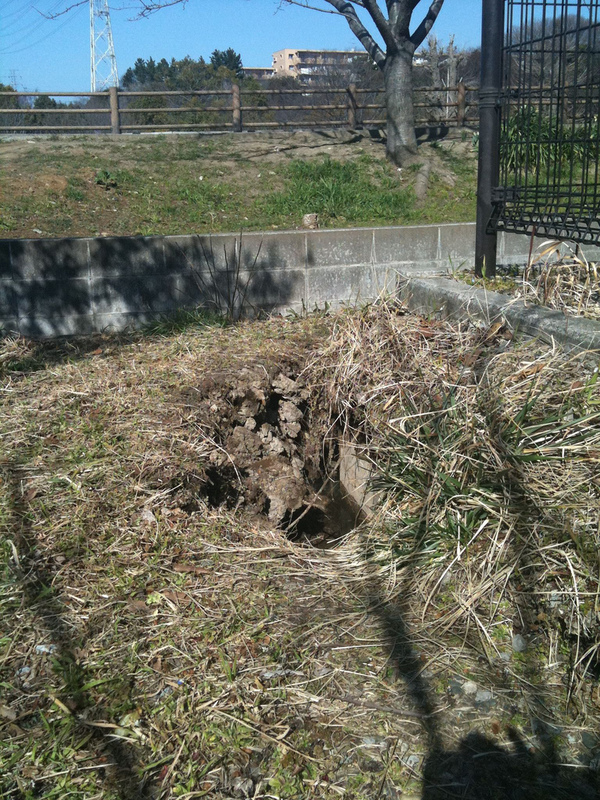 A sinkhole at the park. It actually goes about 5 feet deep. Don`t want to be standing there when the next aftershock hits! So as the week unfolds we see a lot of trouble brewing. In light of the damage and need for power in the north, Japan will be systematically blacking out areas according to its energy needs. This means we could go without power for the maximum of 8 hours or nothing at all, depending on the need at the time. There is an arbitrary time schedule but it is no guarantee of a blackout. Along with candle light dinners and freezing cold mornings, supply lines are blocked due to closed freeways, gasoline shortages, and destroyed roads. This means we may have to live off what we have for now which is not much for a family of five. All this with the potential for more major earthquakes in the next three days makes for a lot of anxiety. But we are taking one day at a time and giving thanks for all we have. We need strength to get through, and not only us but all of Japan does too. It is very easy to lose heart in all of this, yet, I am confident that I am here for a reason. I live and breathe with a purpose and though it is not fully realized, I understand that faithfulness in the little things is all He asks, and He will take care of the big things. Thank you for reading, and for those who pray, know that you are giving us strength. Raising my children is hard enough on a normal day, in a normal situation, now we are being squeezed like never before, let it bring forth something of value, precious in its way. Let the result of our labors to survive be a testament to the grace and glory of God. That is all for now, I have to try and go to work tomorrow. We will see how that goes! Stephen, glad to hear that you and your family are well and unharmed. I hope the worst is over and that things gradually settle down and return to normal. I feel sad for all those who lost family and loved ones due to these tragic events. Houses and roads can be re-built, but a life lost is a life lost. I will keep all of you guys in my prayers! Thanks for keeping us updated, and so glad to hear that you are all ok.
Praying for you, brother. Thanks for the updates... and I hope that food lasts! glad to hear that you and your family are well. we're all in indonesia feel sorry as well. keep spirit and keep safe. May the Lord strengthen you, and give you wisdom in these days. Is there a way to send support? Blessings to you! Thank you for your prayers and caring comments! If any are interested in discussing support of any kind please send me a direct email to stevetsunami@gmail.com. From O'side...I read in the NC Times this morning about your blog. Just want to add my prayers for you and your family. Thank you for this personal look into the situation. God bless. I am with all other friends praying for you and your family's safety.